There is no linky party for Weigh In Wednesday, but I thought I would post my weekly results anyway. I'm pretty proud of myself this week. I was really good with the food, and actually went for a few walks with the pooch this week. I decided to cut all starchy carbs after 3:00 PM so it's basically lean protein and veggies for dinner every night. I have to say it's been a lot easier than I thought it would be. I get to have pasta and potatoes and bread for lunch so I'm not missing it too, too much. I've also been having more fruit as snacks (I've never been a big fruit fan) and start every day with Greek yogurt and oatmeal. I feel full after each meal, don't feel the need to snack so much. Overall, I'm doing really well and I'm feeling even better! Now if I could only get Jillian Michaels to play nice! :-) I purchased her Extreme Shred and Shed DVD recently and I have come to the conclusion that the woman is insane. I couldn't even get through the warm-up without needing a break! Seriously??? Hope you all had a great Leap Day 2012! My February Schnibble is Done! So the pattern this month was i.s.t.h. I have to admit that I hesitated before ordering the pattern - I just wasn't sure I liked it and all those tiny little squares in the border! Did I really want to spend all that time doing this one? I decided to go with 2 Northcote Range charm packs for i.s.t.h. This collection really doesn't offer a whole lot in terms of "darks" or even "mediums", so I had to be a little creative. I decided to keep all the darker charms for the stars to allow them to really pop. I took me a long time to choose the background fabric for this one. Nothing I had in my stash looked really good, so I had to settle for this pink. It isn't the best, but it's not too too bad. The pieced borders took FOREVER! And I used blue fabric I had leftover from another project for the inner and outer top and bottom borders. I can't say this was my favourite pattern to work on, but in the end, I think it looks pretty cute. And I'm really happy I finished it in February! Not much to brag about this week. My favourite trick to lose weight and stay on track has always been to have a "cheat" meal every week. There are a number of reasons for this: first, it tricks your body into thinking it's not actually starving (this is very important, especially if you are limiting yourself to very few calories per day). Second, it gives me something to look forward to every week - sort of a reward for doing a good job all week. Obviously, you don't want to undo all the great work you did so you don't go crazy like have a jumbo pizza and fries all to yourself, but you eat something yummy that's a little too high in fat or sugar for your regular diet. Well this week, I had a cheat WEEKEND!!! So not one meal like I'm supposed to, but 5 huge, fatty but oh so yummy meals... Not good and the results for this weigh in show it. Needless to say, I was a little disappointed with myself, but the goal is to be on track 90% of the time. So back to work I go! And I leave you today with an awesome quote for us folks who say there's no time to exercise or no time to make a good healthy meal tonight... "If it's important, you make time. If its not, you make excuses." 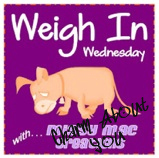 I'm linking up to Missy Mac Creations for Weigh In Wednesday. Please click on the button and say hello to fellow bloggers working really hard on getting healthier. 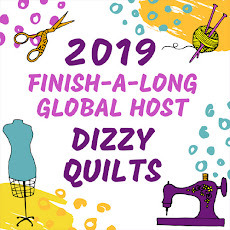 Those of you who have been coming around for a while know that I can only quilt on weekend because all of my quilting stuff is over at the cottage. During the week, I needed to start doing something crafty to keep busy so I started knitting and crocheting. A few months ago, I posted here about completing my very first Granny Square. When I looked at Craftyminx' tutorial for these, I instantly became hooked. Granny Squares are super easy, they are cute, and they are soooooo relaxing to make. Well, this week, I finally finished my very first Granny Square baby blanket! I love it! :-) It is so soft and snuggly. 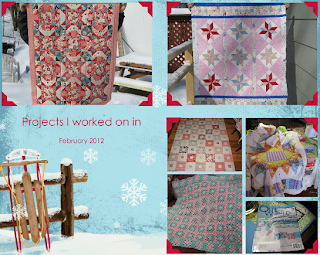 I had a great weekend, but definitely did NOT get as much quilting done as I wanted. It all started on Thursday last week... I was supposed to post my weekend goals, but instead, I got sucked into going to the hockey rink to watch D's son play hockey. We got home pretty late so there was no way I was going to be able to logon and post. Although I make it sound as though I didn't get any sewing done at all, I really did get manage to make progress on i.s.t.h. Not sure how I feel about the colours... I guess we'll see when the whole thing is finished (hopefully next weekend). 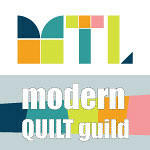 And I did get the quilting done in the first block of Two Percent. I wasn't able to get one decent picture of the quilting so I'll spare you! And that's pretty much all. I wanted to cut more squares out of Uncle Vic's shirts, but I ran out of time and patience. The fabric of the shirts is a really thin and "silky" rayonne-type fabric. VERY difficult to cut accurately. Do you have any advice I could use to help with the cutting process? It's driving me crazy and I'm even tempted to just give up at this point. Any help would be much appreciated! Happy Wednesday all! I hope Valentine's Day was full of love and surprises for everyone... I got beautiful flowers from my sweetie and I'm finally feeling much better after a few days of coughing, sneezing, sniffling, the chills and basically not sleeping more than one hour at a time because I was congested to the point where I thought I was sufficating! I'm not surprised I lost more this week because when I'm sick, I'm not hungry at all. My whole diet consisted of chicken noodle soup and tea with a bit of honey for 3 days. But I am quite proud of the fact that I am now almost half way to my goal of losing 30 lbs by my birthday in June. I knew it was going to happen, everyone around me has been sick with a nasty cold for days now, so I got up on Saturday morning with an awful head and chest cold. I stayed home from work today because I'm still feeling pretty crappy. Congratulations to you both! Please send me an e-mail with your mailing address so I can ship your prizes! The February Schnibble Pattern is here! I got home from work today and found an envelop on the table from none other than Kimberly at Fat Quarter Shop - the February Schnibbles pattern has arrived! Yay! Isn't it adorable? I cannot wait to get to the country tomorrow and get going on this one. 1. Decide which charm packs to use for i.s.t.h. 2. Cut all of the pieces for i.s.t.h. 3. Finish quilting the first block of Two Percent. What about you? What plans do you have for the weekend? P.S. 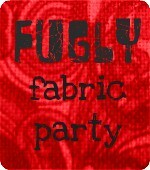 The Fugly Party is still going on at Lucy's blog... Why don't you go over there and check out the fabric that's up for grabs on everyone's blog! It's Wednesday and over here this means time to Weigh In. I really wasn't super good this week and barely exercised at all so the results aren't great. But I keep telling myself this is a process, a life change, not a diet and not something I'm going to stop any time soon, so as long as there is progress, I'm going to be happy. I noticed this week that one pair of pants that I wear for work is almost falling off me - you know your pants are getting a tad too big when the crotch sits almost mid-thigh! I'm still counting my calories, I cut the number of morning coffees to 2 and I only put 2% milk in them, I have 1 cup of green tea every day and I started taking a multi-vitamin. I have to say I'm feeling much better than I have in years. I'm linking up to Missy Mac's again this week - be sure to go over and spread some encouragement! 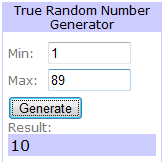 Important: This giveaway has now closed! 1. For one chance to win, leave a comment - you can say anything you want! 2. 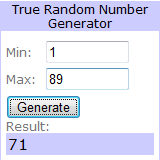 For a second entry in the draw, be a follower (new or existing) and tell me you are in a comment. That's it! This giveaway will be open until Noon (ET) on Monday, February 13. I will announce the winner Monday night. Oh - and don't forget to hop on over to Lucy's blog and check out what everyone else is offering! I had a wonderful weekend once again... Hockey games, lots of sewing, great meal and company Saturday night and the Super Bowl (I only ever really watch it for the half-time show - which was amazing this year!). I'm not 100% sure I'm in love with the fabrics and pattern together. I'm thinking this particular pattern needs a little more contrast, but it'll have to do! This pattern is called Kaleidoscope and I found it in the Pam and Nicky Lintott book "Two From One Jelly Roll". The fabric is Giddy by Sandy Gervais for Moda. I have the backing and binding fabric ready to go so this should be a fairly quick finish once I decide on a way to quilt this baby. I'm really liking this! :-) I'm planning on using this motif for the center squares throughout and then use the flower and the heart motif on their own for the star points. I'll do some loops or some other kind of FMQ in the white areas to finish it off. Quilting the whole thing is probably going to take me months - I don't have the patience to sit there all day doing the same motif over and over again. 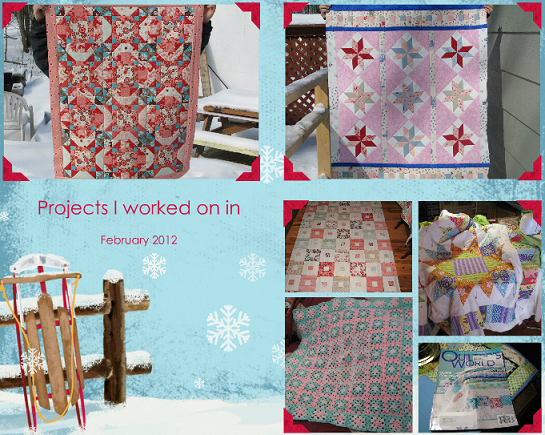 I'll probably end up quilting one square per weekend for about 3 months! So 2 out of 3 goals reached this week... not bad! Yay - the week is almost over already! It's been another crazy week at work so I'm extremely pleased the weekend is near. The weather is supposed to be pretty good too around these parts so I might be able to spend a little bit of time outside. 1. Definitely start quilting Two Percent - even if it's just some basic straight lines to begin with. 2. Finish the top of my newest project (Kaleidoscope by Pam and Nicky Lintott). Also, almost a year ago, my sweetie's favourite uncle passed away and his aunt gave us (him!) a bunch of Uncle Vic's Hawaiian shirts (his trademark really - he was always wearing one!). My sweetie is probably never going to wear those shirts so I offered to make him a quilt with them. He loved the idea, but instead of keeping the quilt for himself, he decided he was going to give it to his aunt. So all that to say I have to start cutting the Hawaiian shirts this weekend. And that is all I can commit to for this week. Here we are at the end of our 1st month... and I'm super excited to share my results! If I keep going at this rate, I will have lost 50 lbs by my birthday! How cool is that?! Counting my calories has really, really helped. And it's helping for 2 reasons: 1st - it's keeping me on track and making sure I'm not overeating. 2nd - before I put anything into my mouth, I make sure I have its nutrional value so I can track the calories, fat grams, etc. A lot of times, I'll end up not snacking because I simply don't know how many calories I'm going to be eating. Make sure you go over to Missy Mac's and give some support to fellow bloggers!